In the Irish Luck online slot machine, Playtech invites us to sample the proverbial “luck of the Irish” in their innovative, and colourful take on the format. We join a ginger-haired maiden on her quest for riches, and there’s plenty of luck-related symbolism throughout the game. Whilst the slot doesn’t break from the standard five reel, three row format, it doesn’t feel too visually repetitive thanks to its creative art style. Overall, the machine looks and sounds great. There’s bright graphics throughout, and some traditional Irish rhythms that are perfect to get your feet tapping along. Loads of ways to mix up bets. Players can alter three different variables giving them maximum control when it comes to spreading their money across the reels. Great colours, theme, and music. The art, and soundtrack create an authentic feeling game that’s fantastic fun to play. Not the most varied in terms of features. There’s only one real bonus stage. It’s a potentially lucrative one but the lack of diversity of other machines is noticeable. Maiden (“wild” symbol) = 10,000x the coin value. Horseshoe, or ring = 750x the coin value. Pot of gold (“scatter” symbol) = 500x the coin value. Clover = 400x the coin value. Harp, or Celtic symbol = 250x the coin value. Using the above values, and with the stake set to the maximum, the highest possible win during the regular game is an impressive £500,000 – much easier money than seeking out the end of a rainbow! Irish Luck features a couple of great bonus features which can really help increase your winnings. These may not be as extensive as on similar machines, but the high value of the main game symbols, plus the massive potential free spin multiplier more than make up for this. One great feature about this machine is that wilds can be stacked on all reels. This means players receive the maximum possible pay out per spin. What’s more, each win which uses the Irish maiden wild symbol as part of a winning combination gets doubled, making for enormous potential pay outs. 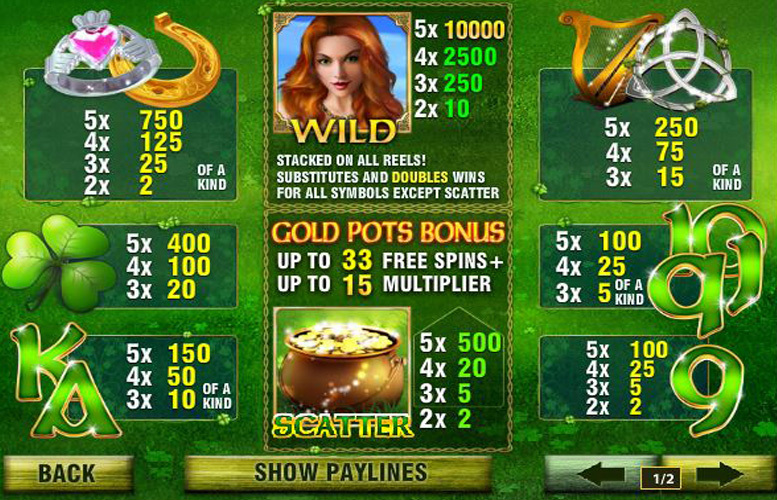 Three gold pots anywhere on the reels will activate the Gold Pots Bonus round. The default prize is eight free games with a 2x multiplier. 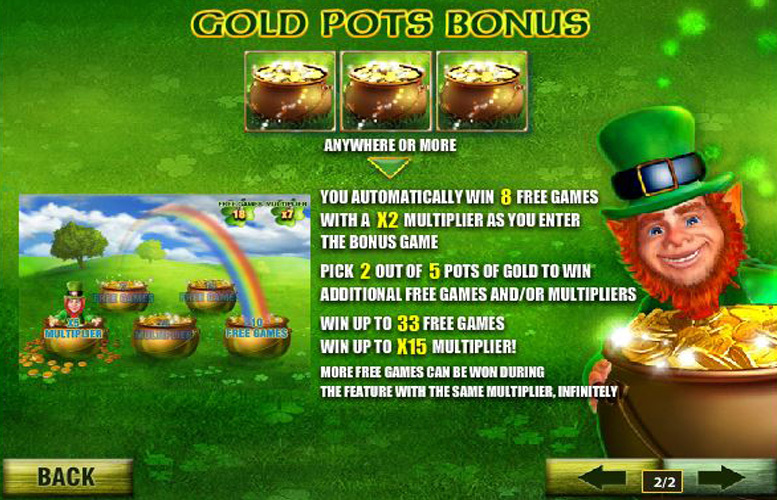 Players are then requested to pick two of five pots of gold to win additional free games, and/or multipliers. There’s a potential total of 33 free games up for grabs, with a generous 15x multiplier. What’s more, players can retrigger the bonus round during free spins, and this dynamic can repeat indefinitely. Ace, or King = 150x the coin value. Queen, Jack, Ten, or Nine = 100x the coin value. Undoubtedly one of the best things about the Irish Luck slot machine is the number of different betting variables players can alter. There’s options for the number of active pay lines, the number of coins bet per line, and the value of each coin. There’s up to a massive 30 pay lines available across the five reels, and players can choose between one and ten coins to wage per line. The maximum coin value is an impressive £5. With all these variables set to the minimum, the smallest bet possible is 1p, and with them maxed out, the highest bet a player can wage is a sizeable £1,500. 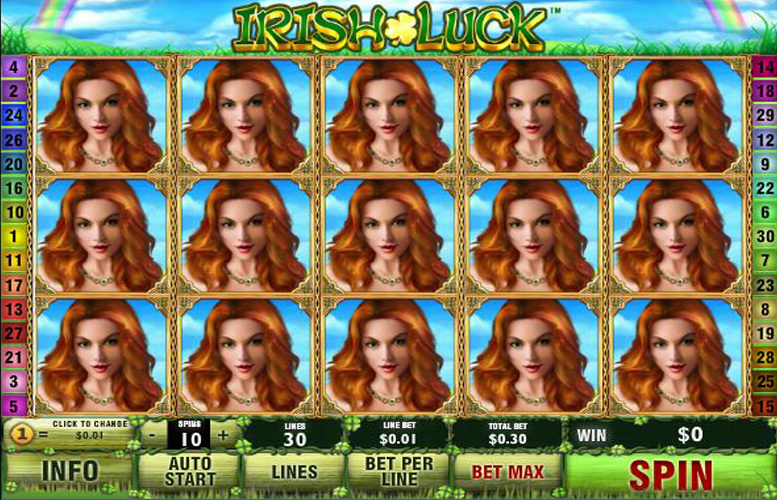 The Irish Luck online slot machine is certainly a game with a great feel. The colours are vibrant and the traditional Irish music is fitting and complements the action. The gameplay might not be as varied as some of the other slots around but despite this, the bonuses can be very lucrative. This game has a rating of 4 / 5 with 624 total reviews by the users.